While some pieces of conceptual architecture guide out imagine toward distant planets, others plunge us into the depths of the ocean. These underwater cities concepts, dreamed up by illustrators, architects, and designers, imagine the sorts of structures we might inhabit beneath the watery surfaces. A collection of specialised organisms function as a whole, with some pods being industrial, energy, or food producers. Dreamed up by Arup Biomimetics, presented at the 2010 Venice Biennale and pictured above. 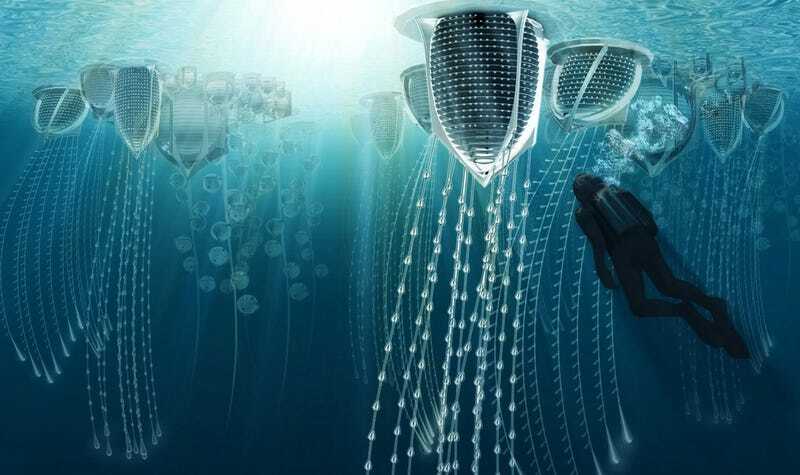 This self-contained city would float on the surface of the ocean or hide in the depths, and would be used for aquanauts and oceanographic life sciences. Designed by Phil Pauley. This design imagines an inverted skyscraper, diving down to a depth of 1,312 ft (400 m) with a total floor area of 2.28 million sq ft (212,000 sq m). Its four wings are big enough to accomodate the world's biggest ships. Designed by the British Columbia-based Zigloo in 2010. It was a proposed chain of underwater five-star resorts 40 feet underwater in a 5,000 acre lagoon few years ago. The Lady Landfill was designed by three Serbian architects, Milorad Vidojevic, Jelena Pucarevic and Milica Pihler for the eVolo 2011 Skyscraper Competition. The giant skyscraper would collect and recycle the waste of the Great Pacific Garbage Patch into an energy source. These buildings are designed to be oceanic research stations and underwater cities for about 6000 people. They would also contain a vast number of additional facilities – cinemas, fitness clubs, recreation spaces and a hospital. Designed by the Eindhoven-based Dutch De Bever Architecten BNA. The Malaysian Sarly Adre Sarkum's concept envisions a self-sufficient structure: it generates its own electricity using solar, wind and wave power, has its own food farming system and a small forest on the surface. The kinetic energy-using system of ballasts is meant to keep the Water-Scraper upright. From the book Explorers of the Deep: Man's Future Beneath the Sea. From Das Neue Universum (The New Universe), created by Klaus Bürgle. From the book Out of Time: Designs for the Twentieth-Century Future (1954). The picture was published on the cover of if magazine in January of 1954.